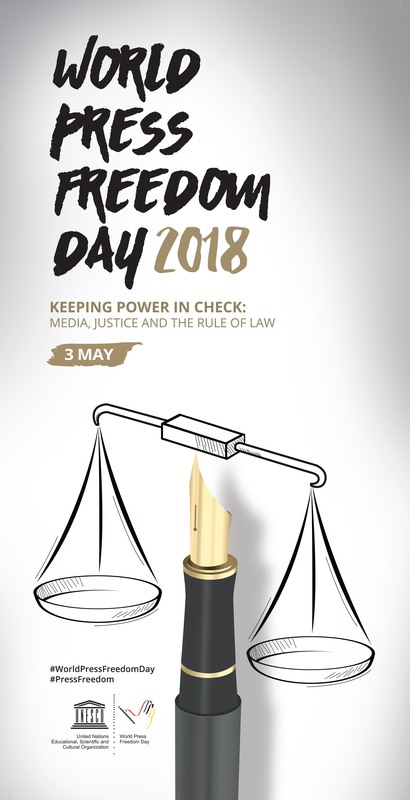 As they have every year since 1993, when UNESCO proclaimed May 3 as World Press Freedom Day, journalists and freedom of expression advocates in Latin America and around the world gathered at conferences and rallied online to discuss the importance of press freedom and ways to the threats it faces. UNESCO held the 25th annual celebration for World Press Freedom Day in Accra, Ghana, in conjunction with the Government of the Republic of Ghana. At the event, which had the theme, “Keeping Power in Check: Media, Justice and The Rule of Law,” the organization launched its 2017/2018 global report “World Trends in Freedom of Expression and Media Development.” An executive summary of the report is available in both English and Spanish. Lanza is Special Rapporteur on Freedom of Expression for the Inter American Commission on Human Rights (IACHR) and Kaye is UN Special Rapporteur on Freedom of Opinion and Expression. The declaration addresses multiple threats to media, including threats to media safety, legal threats, political threats, technological threats and economic threats. It also addresses the responsibilities of media and online platforms to respect human rights and urges them to “enhance their professionalism and social responsibility,” operate transparently, and support the independent work of media. Various Latin American journalism and freedom of expression organizations held events on May 3 in commemoration of World Press Freedom Day. In Argentina, the Association of Argentine Journalistic Entities (Adepa) created a campaign focused on defending the role of professional journalism as a solution to the dissemination of false news. The campaign was spread on social networks and in the main digital, radio and TV news media in Argentina with the hashtag #periodismoprofesionalSI and #noticiasfalsasNO. "Even in social networks and technology platforms, professional journalism still has editors who respond for what they publish. Freedom of the press means that professional journalism is recognized by digital platforms," Adepa stressed on its site. The Foundation for Freedom of the Press (FLIP) in Colombia said it had recorded 150 violations to press freedom, affecting 177 victims, since the beginning of 2018. This was 63 more attacks than the same period from the previous year. In particular, said May 3 marked 20 days since the disappearance of a team of Ecuadoran journalists from newspaper El Comercio was confirmed near the Ecuador-Colombia border. The journalists, detained by a group of dissident FARC members, were later confirmed killed, but their bodies have still not been recovered. The organization is using the hashtag #VotoInformado to encourage candidates and followers “to promote a favorable environment for freedom of expression” since aggressions have worsened leading up to presidential elections. It also created mini videos under the name “On the Record” in which leading Colombian journalists discuss censorship. FLIP and freedom of expression organization Proyecto Antonio Nariño hosted a joint press conference on May 3 to discuss freedom of expression in Colombia and objectives for media, public entities, audiences and journalists. Well-known Cuban independent newspaper 14yMedio highlighted that, thanks to technology, several independent media have appeared in Cuba in recent years despite heavy restrictions that the Castro government has maintained over the press for decades. According to the media outlet, this boom in journalistic spaces is also due to the impulse of an audience that demands greater diversity of topics and angles. "Fashion magazines, digital sites dedicated to baseball and portals with feminist approaches are part of the new and varied information ecosystem." Freedom of expression organization Fundamedios and Dialogando Ando organized the conference “Periodismo en Riesgo” (Journalism at Risk) to mark World Press Freedom Day. Journalists Arturo Torres, Dolores Ochoa and Rodolfo Asar spoke about practicing journalism in Ecuador and reporting in complex areas. The journalists also called attention to the missing journalists from El Comercio, as well as “hundreds of Ecuadorian victims of drug trafficking and organized criminal groups operating on the country’s northern border,” according to Fundamedios. In Mexico, the first winner of the Breach/Valdez Award for Journalism and Human Rights was recognized at a ceremony in Mexico City. Daniela Rea was honored with the prize, named in honor of journalists Miroslava Breach and Javier Valdez who were both killed in 2017 because of their investigative reporting. There have been small advancements in both murder cases, but human rights advocates are pushing the Mexican government to identify and punish the masterminds in both cases. For the Mexican chapter of Article 19, an international freedom of expression and information organization, the global commemoration of press freedom should serve to remind the government of Mexico of the forgotten debt it has with all journalists who have lost their lives while carrying out their work, journalists who suffer from self-censorship due to the situation of violence in the country, and who are affected by the threats and actions of organized crime as well as those of government officials. Every year Mexico sets a new record of attacks against the press. Between the years 2009-2017, Article 19 has documented 2,765 attacks against journalists and media. More than half of them (1986) occurred during the term of the current Mexican President Enrique Peña Nieto, who is about to conclude his time in office. The Press and Society Institute (IPYS) and the European Union in Peru held the Europe-Latin America Conference for Investigative Journalism, which discussed coverage of corruption, organized crime, money laundering and treatment of persons. The conference, which is being streamed live online, continues until May 5. IPYS Venezuela launched the campaign #QueNadieNosCalle (Let no one shut us up). A video from the campaign presents testimonies from people whose freedom of expression has been violated. The video begins with Alba Cecilia Mujica, who suffered internal censorship from her channel, Globovisión, at the beginning of 2018 for commenting on her morning program about the alleged extrajudicial assassination of rebel leader Óscar Pérez. Freedom of expression organization Espacio Público also released its 2017 annual report on the situation of the freedoms of expression and information in Venezuela. According to the report, the organization recorded 708 cases, which totalled 1,002 complaints of violations to freedom of expression, in 2017. The IFEX Network, which is made of more than 100 freedom of expression and press freedom organizations around the world, including Latin America, launched the social media campaign “One Side of the Story Is Not Enough.” Member media outlets published photos of world leaders being interviewed by the news media, except the journalists had been replaced by the figureheads themselves. At a press conference, U.S. President Donald Trump takes questions from other Donald Trumps. Russian President Vladimir Putin pontificates to himself during a sit-down interview. The photos serve to emphasize the importance of independent media that can resist efforts to control information. The International Women’s Media Foundation (IWMF) took the day to call attention to the lack of women reporters that continues to permeate the news industry. According to the organization, the number of women in newsrooms has increased by just 1 percent in 16 years. Supporters were encouraged to spread facts like these on social media using #CheckYourBylines. In most Latin American countries, impunity, violence against journalists and authoritarian policies against the press continue to be a problem, according to Reporters Without Borders (RSF). In its recent ranking on press freedom in the world, RSF rated Cuba (ranked 172 out of 180), Mexico (147) and Venezuela (143) as the countries with the lowest rating in the Americas, and Costa Rica (ranked 10) as one of the ones with the most solid legal framework on freedom of information issues. According to the UN, in Latin America, 9 out of 10 cases of attacks against journalists go unpunished. The entity said 142 journalists have been killed in the region between 2012 and 2016.